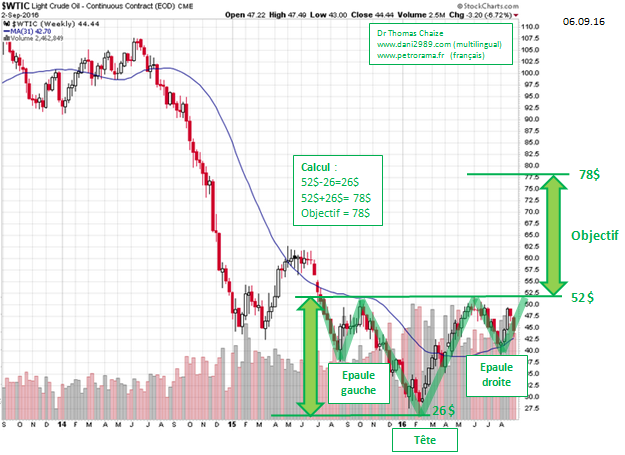 Oil prices: an inverse head shoulders? 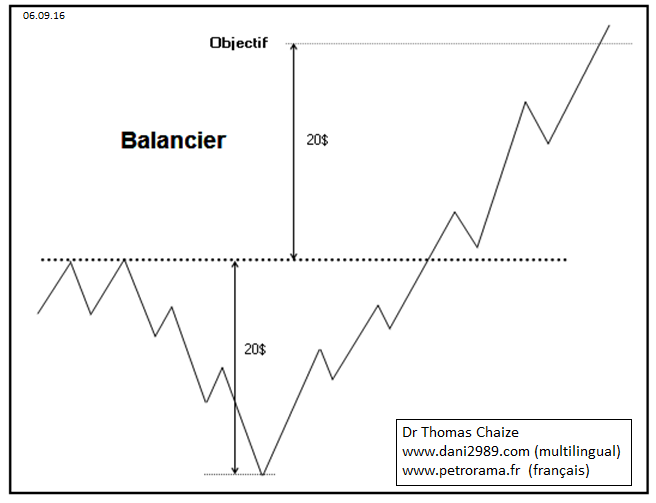 While the unique French oil exploration company is acquired by a member of OPEC (...), in general indifference, the price per barrel WTI, it seems we build a nice little head shoulders reversed what could be a wave trough. For those who do not know the technical analysis Figure shoulders head and one of the most popular figures as easy to identify and very effective. Here is a small diagram of an inverted head shoulders (or depressions) to better understand the form. For the price of oil, on the chart below, the left shoulder was formed June to October 2015, the head from October to June 2016 and the right shoulder is being built. To that figure is confirmed, it is necessary that the oil price per barrel goes its neckline at $ 52, preferably with the volume (note that the volume increases since the construction of the left shoulder). Then, once the current passes his neck line, it is possible to establish a price target. We calculate the height of the head (the highest peak), $ 26 here, which is added to the neckline, giving us here an objective to +/- 78 dollars. Note that here the MM200 days served resistance and support left at the top of the right shoulder. The construction of the inverted head shoulders is particularly interesting when we take a step back, say 20 years. 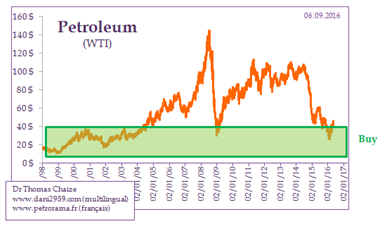 On the chart below you can see that the price of oil is in what we can identify as a long-term cycle trough. In short, the oil price is now between his MM200 at $ 41 and its neckline at $ 51/52. If it falls below its MM200 ($ 41) is bearish. But if the oil barrel WTI exceeds its neckline, it has 58% chance to reach its target to $ 78 and the average increase is 30%, according to the work of Thomas Bulkowski. - Here I use technical analysis because it seems impossible in the short term to use fundamental analysis to determine the price of oil. Although imperfect, this seems the most appropriate tool. - I recently created a LinkedIn account. For those interested, it is possible that I created occasionally specific content to this support for professionals.